My ramblings today will be on nothing other than Sherlock Holmes. No, I will not be talking about the novels by Sir Arthur Conan Doyle (for I have not read them yet… I know… shame on me) but I will be discussing the new bbc series which is currently being aired. The series is called Sherlock and is a modern version of Sherlock Holmes. At first I did not exactly know what to expect, but whatever it was, I was convinced that I was absolutely going to hate it… I usually dislike modern adaption’s of older stories (which is why I probably disliked the movie Guy Richie recently made… or even the old ‘modernized’ version of Romeo and Juliet with Leonardo DiCaprio). However, I was curious and wanted to at least see what they had done with it. I sat myself down on the couch in front of the TV and prepared myself for at least 30 minutes of embarrassment, agitation… and other types of torture (yes I had decided that I would at least have the decency to watch at least 30 minutes of it before turning it off… I thought I would owe the director that much). And so I watched… and watched the entire 1,5 hours and was amazed, happy, excited (no not in that way you perverted reader!) and absolutely hooked! 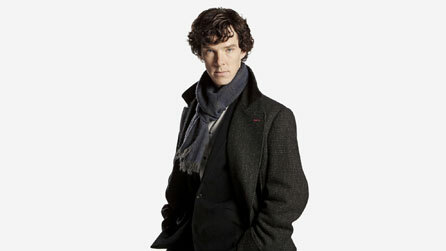 He is just as stoic, particular and… perhaps as strange as one would expect of a Sherlock. He thinks extremely fast (far too fast for those around him), he shouts with joy when it discovers that there is a serial killer on the loose, he’s always looking to find something to keep his mind busy (and if he does not succeed, he uses drugs to do the trick) and he has an incredible talent for bossing Dr. Watson around. Oh and there is an abundance of extremely dry remarks that he constantly makes at the ‘stupidity’ of those around him. Dr. Watson the trustworthy, elderly guy with a moustache that we know him as, but is now a doctor who has just returned from Afghanistan (where he was shot in the leg), is in perfect shape (although at first he does walk with a crutch) and is somewhere in his thirties. However, he, just like the original Dr. Watson, is the only one that can keep up with Sherlock and is the only one that he sees as a friend… Though in this particular situation the ‘friend’ term has become a little awkward, for yes, they have made Sherlock gay. Which basically is the only downside to this series…. WHYYYYYYY did they have to make him gay? *sob* Sherlock Holmes is not gay! He is just indifferent to either males and females… he was a-sexual! (which is not completely uncommon, the writer T. S. Elliot was it as well). But oh well, I will forgive them for this little change. Especially since Dr. Watson is still straight I can live with it… If they decided to put Sherlock and Watson in a relationship… I think I would have started to send hate mail to the directors and screenwriters hahaha. Oh and there is one other mistake which they made… the series only consists of 3 episodes…. *sob* We want more! We want more! I really hope that they will make more episodes soon. So the general message of this entry: WATCH THE SERIES even if you have to download it. I am a number one fan of the Sherlock Holmes Series by Conan. I just love it, I've got a book with all the wonderful stories, yes Watson is an 'elderly' (older then Holmes that's for sure) doctor who has returned from the war, he does have an injury and it takes him a little to get used to what Sherlock believes in, (not to mention his arrogance and large ego) as for Holmes and his orientation I am rather pissed at that lol, he does end up falling in love with one of the female criminals that he is going after. A love born out of respect, at least that's what I've been given to understand do to the fact I am still in the beginning, My father used to read me the stories when I was young so I can't remember much (that's why I am re-reading them for my own pleasure :D) Still I'm glad people are picking up Holmes again, I just wish they didn't busher that woman chaser (because he kind of was).